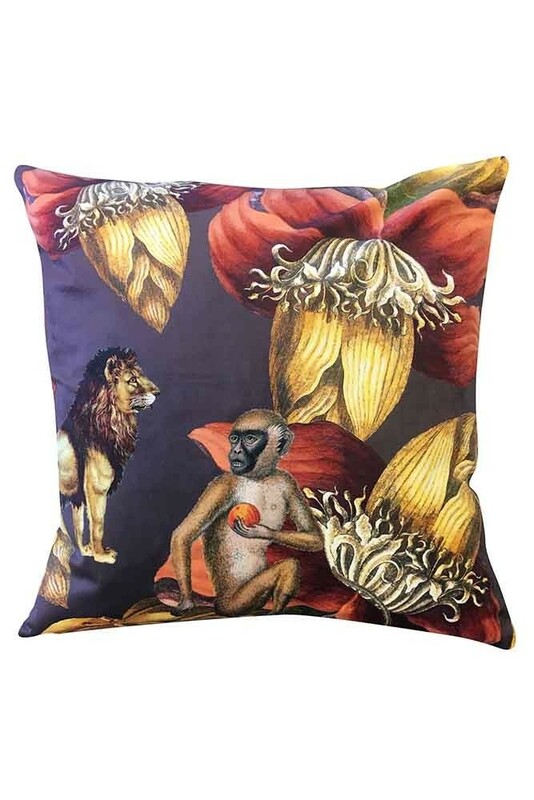 A beautiful velvet jungle motif cushion the Exotic Jungle Velvet Cushion features a rich plum background with exotic flowers, a lion and a monkey. 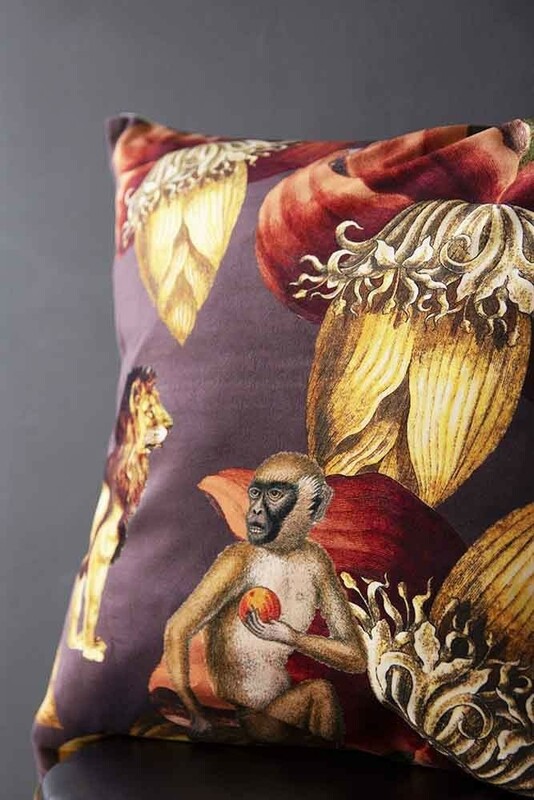 Made from velvet the beautiful Exotic Jungle Cushion measures 50cm x 50cm. No home should be without cushions. Great for adding texture, colour, cosiness and even sophistication and glamour to your décor, it’s always a good idea to get your hands on some cool cushions. Great for adding colour and depth to your interiors the colour pop jungle cushion will look fabulous in your home. In fact, we think that it’s a really lovely cushion for those who want to experiment with colour in their homes without braving painting the walls in a vibrant colour! 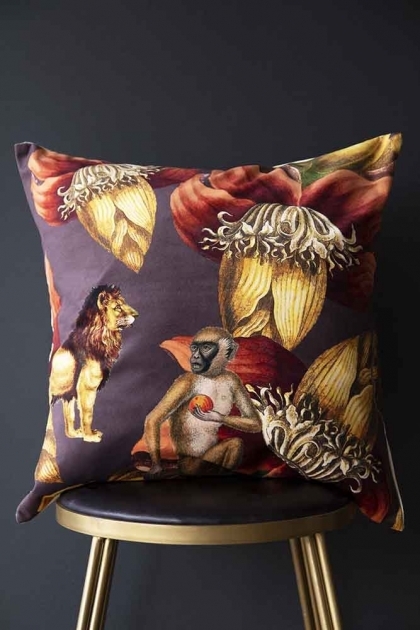 Even better, the quirky Exotic Jungle Monkey & Lion Cushion has a luxury velvet fabric that will soften your interiors with a uber glam twist. A beautiful cushion for your bedrooms, living spaces and hallways, why not give this beautiful jungle themed cushion as a gift to your loved ones?! It would be a fantastically unique gift that will brighten up their homes! 1. How many cushions are too many cushions?! The limit does not exist! We really don’t think that there is a limit as to how many you chose, but a top tip would be to display the cushions on your sofa in odd numbers as this is a visual trick used by interior designers that looks fabulous. 2. Mix it up! A great way to create an impactful cushion display is to choose cushions with different patterns, designs or textures. For example, you could choose some plain dark coloured cushions as the backdrop and then add in the Exotic Jungle Velvet Cushion to the mix to add colour and interest. 3.Size Matters. Another visual trick is to choose cushions of different sizes and shapes. Matching cushions creates a more formal aesthetic whilst cushions of different sizes creates a more homely and eclectic feel in your home.